at least one ball but more are preferred. You start with a basic 3-2 situation. The defending goalie starts with the ball. The offensive team starts their attack. Retrieve the ball from the goalie and try to finish their attack. When a shot is fired the attack is over. 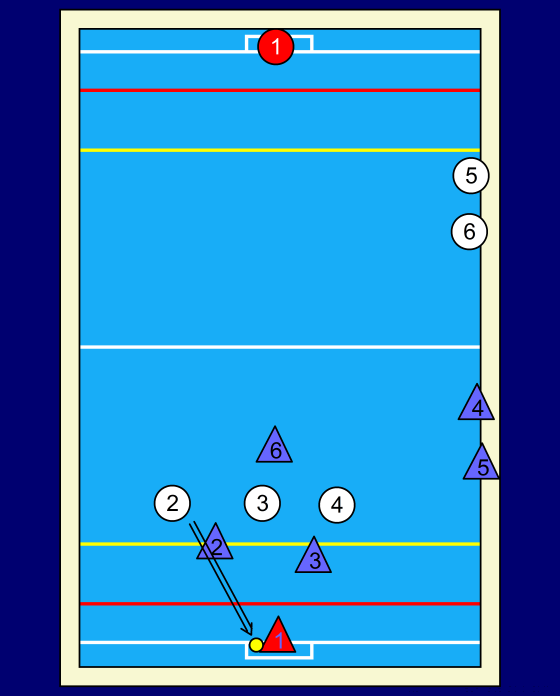 When the last attacker crossed the middle line one defender sprints to the middle of the pool and then he's going to help his defenders. When the shot is fired. The defenders become attackers and the attacking team moves to the side of the pool. Two of their team already lie ready in the middle to defend the 3-2. Again when the last attacker is over the middle line a defender swims tot the middle and then resumes with helping his team buddies in the defense. This circle goes on and on. If you have a very big group you can do this drill in 5-4 formations or even a 6-5 formation. The drill is very useful for players and keepers, defenders and attackers.